Brentwood, TN – For the second time in four years an Austin Peay State University baseball pitcher has grabbed the attention of the Ohio Valley Conference’s coaches and baseball sports information contacts as senior left-hander Jacques Pucheu was named the league’s preseason Pitcher of the Year. Additionally, Pucheu and utility man Parker Phillips were each named to the Preseason All-OVC team after earning Second Team All-OVC honors in 2018. As a team, Austin Peay was picked to finish fourth in the league’s preseason poll with the opening day for college baseball just two weeks away. A Gulfport, Mississippi product, Pucheu pieced together an impressive campaign for his first All-OVC recognition last season. He was one of three pitchers to record six conference wins while striking out 64 OVC batters (4th most). Pucheu also ranked among the OVC top 10 in overall earned run average (4.03, 8th), strikeouts (101, 4th) and victories (seven, 7th) for the entire campaign. 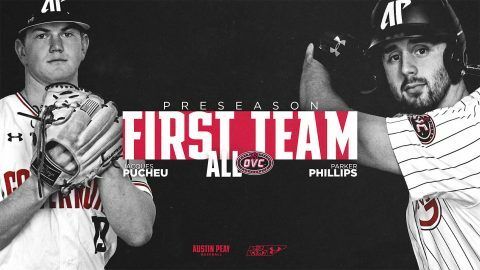 Pucheu becomes the second Austin Peay pitcher to receive Preseason Pitcher of the Year honors since the league began releasing preseason honors in 2008. He joins alumnus Alex Robles who was the 2017 preseason choice on the mound. Phillips, of Collierville Tennessee, earned his first All-OVC honor and finished 2018 as the league’s home run leader. Astoundingly, he did the bulk of his damage against league foes, belting 17 of his 19 home runs in the 27 OVC games he played. Phillips’ .943 slugging percentage in league play was an impressive 171 points better than the second-ranked player in the league. In addition, his 44 RBI in league play was second-most in the league. Austin Peay was picked to finish fourth in the regular-season race. The Governors were picked behind preseason favorite Morehead State (185 points, 11 first-place votes), Jacksonville State (173, 6) and Tennessee Tech (166, 5). Austin Peay received 143 points and was picked ahead of Southeast Missouri (142), Eastern Kentucky (110), Belmont (88) and Eastern Illinois (77) which rounded out the league’s top eight teams. The Governors open the 2018 baseball campaign when they host Southeastern Conference foe Kentucky in a three-game series opening with a 3:00pm, Friday contest at Raymond C. Hand Park. Season tickets and single-game tickets are available on the Austin Peay athletics website (LetsGoPeay.com/buytickets) or by calling the APSU Athletics Ticket Office at 931.221.PEAY (7329).